This restart of the Sonic series is my first time jumping into the Sonic comic pool and while I have been a fan of the Sonic games since I got my very first Sega Genesis, he has never been my favorite video game character. However, I do love the side characters from the games and that's what has put a smile on my face so far here. 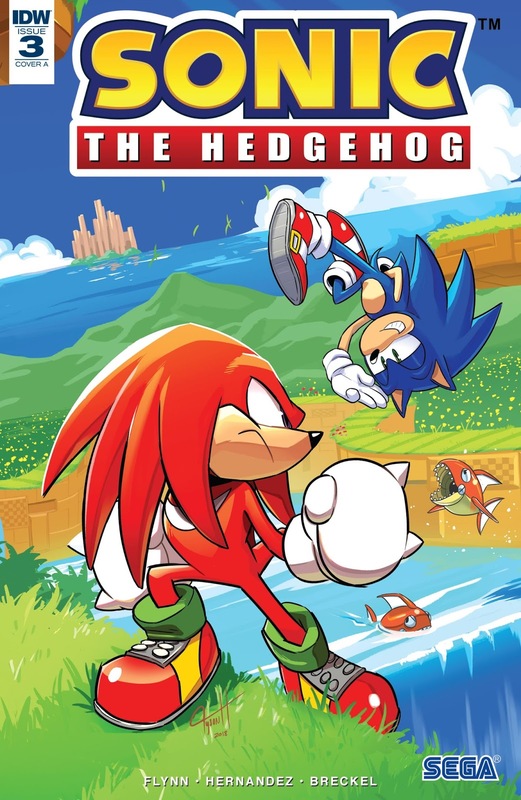 The trend of the "sidekick of the week" continues as we get some Sonic/Knuckles action and it starts off right away. The issue opens with Knuckles taking care of a Death Egg Sentry and Sonic (arriving a tad too late to get in on the action), get themselves and the reader caught up with what's been going on. Knuckles, like Sonic, is not in for all that Resistance nonsense and mentions he'd like to get back to the good old fun of Angel Island right before entering the town with Sonic to find out the what's what. It seems that the town was duped by some villains in disguise that promised to save the town, but instead ended up taking it over by stealing its wisps and everything else they could get their grubby little hands on. Of course, Sonic and Knuckles head off to "talk" to these bad guys. The baddies are Rough and Tumble (introduced in Sonic 3) and after a rhyming intro, it's fighting time! 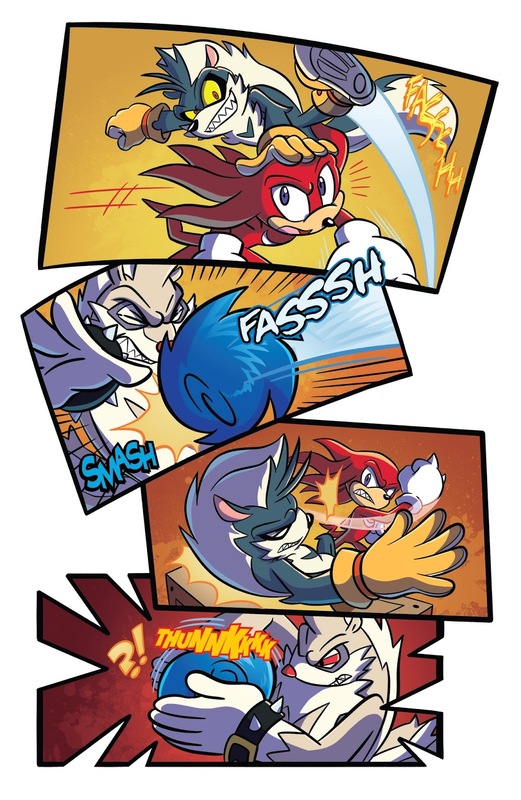 The best part here is how unconcerned Sonic is, but the fight does last a while and even though Knuckles is hit with a 'Stink Bomber", our two heroes finally have the skunk brothers on the ropes...until they arm themselves with Wispons. A Sonic "Independence Day" speech turns the tide and Rough and Tumble go down like the lame enemies they are and it's party time! 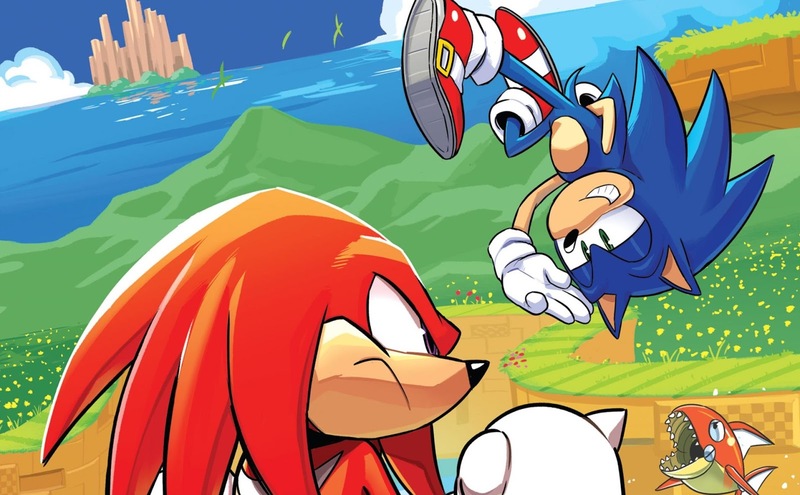 While Sonic, Knuckles and the townsfolk celebrate, however, we see our mysterious bad guy is watching and realizing that Angel Island is unprotected, has eyes on a very important emerald. After the first two issues, this one really was in danger of falling into the "same old, same old" trap. However, Rough and Tumble showing up really rose the fun factor and by the end, I wanted way more of them! Yea, the middle section is just a prolonged fight that reeked a bit of padding, but that's par for the course. In the end, it's all about fun and great art and you get that here. 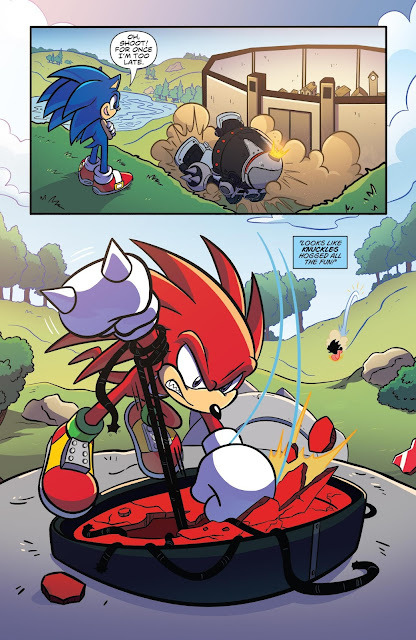 A special nod to the tie-ins to Sonic 3 for issue #3 by the way, it made me smile just seeing that. Sonic continues his tour of duty this week and Knuckles is along for the ride. It's actually the villains that steal the show and while this series definitely has a formula early on, it's fun and it all looks fantastic. If you are a Sonic fan, there is no reason at all not to be checking this out.